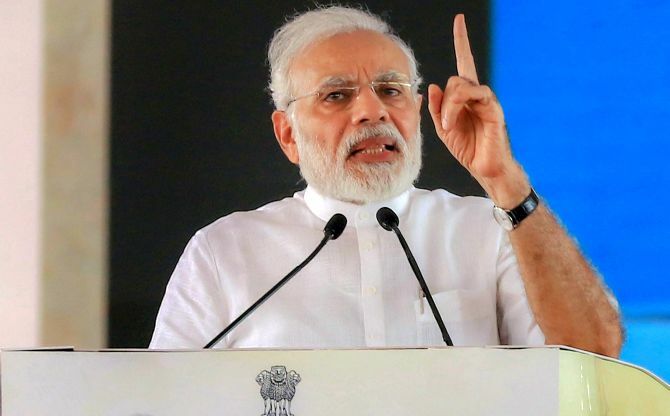 Launching a scathing attack on the Congress, Prime Minister Narendra Modi on Saturday said the opposition party was now being called a ‘bail gaadi’ as several of its leaders were out on bail. “Several leaders who are called stalwarts of the Congress and former ministers are out on bail these days,” Modi said at a public rally, punning on the Hindi term for a bullock cart. Making an apparent reference to the surgical strike into Pakistan-occupied Kashmir in 2016, he criticised the Congress for questioning the capabilities of the army. Modi was addressing a rally of beneficiaries of welfare schemes run by the Centre and the state government in Bharatiya Janata Party-ruled Rajasthan, where assembly elections will be held later this year. The prime minister laid the foundation stones -- symbolically, through remote from the Amrudon ka Bagh rally venue -- for 13 projects worth Rs 2,100 crore in various districts of the state. Criticising the Congress, he said the parties following the politics of family and dynasty may continue like that, but the BJP government was committed to taking the country’s defence and self-respect to their pinnacle. “The country today is at a crucial stage. We have started moving towards a new direction and I believe that the government, with the cooperation of you all, will gain success in fulfilling its commitments,” he said. Without taking names, the prime minister said some people get disturbed on hearing the name of the BJP. He mentioned Jan Dhan Yojna, crop insurance scheme, housing schemes, Ujjawala Yojna, Mudra scheme and the soil health card. He also talked about the recent hike in the minimum support price of farm produce. Chief minister Vasundhara Raje also targeted the Congress in her address, saying the party had worked only for benefitting its own people. Recorded statements of the beneficiaries were played out at the beginning of the public meeting. Later, the same people met the prime minister on the dais. Groups of farmers also met him. Governor Kalyan Singh and Union ministers Gajendra Singh Shekhawat, Arjun Ram Meghwal, Rajyavardhan Singh Rathore, P P Chaudhary and C R Chaudhary attended the event. Will it be a Modi Sarkar in 2019?